Chaumont Bay Lake Lodge off Lake Ontario! 4 Bedroom, 2 Bath Lakefront home with Sunsets and deep clean water! 2000SF 4 Bedroom, 2 bath Year Round lake home just steps from the water with incredible views and sunsets! 13X25' boat slip, open dining/kitchen/living room, 2 beds/bath on each floor, screened in porch, internet, 5 stations on TV, Board Games, awesome quiet dead end street walkable to town! 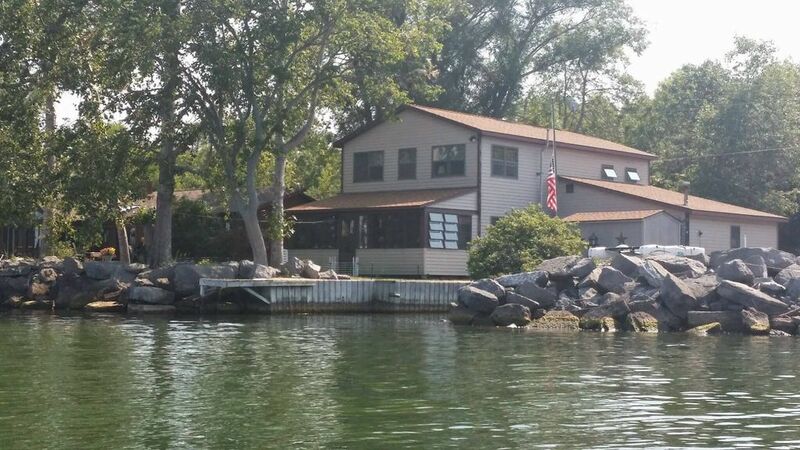 Sleeps 10-12, lower winter rates available, outstanding fishing/Ice fishing, swimming, deep water boat slip, close to 1000 Islands region and more! I am a NY State Licensed Broker Owner of Lake Ontario Realty and know this area well and love it and love sharing it to the world! I was featured on HGTV's Lake Front Bargain Hunt show in 2016/2017 and also own the local Lake Ontario Gift Shop and my Mother owns the Local White Caps Winery. We love and are invested in this area and showcasing it to all that find this gem of a place! Thank you Alex! Glad you had a nice stay! Connie thank you so much and I'm so glad that you guys enjoyed your stay with us! Look forward to having you back enjoy the rest of your Year and thank you again! The house was great, it had everything we needed. Wish we could have spent more time there. I can't say enough good things about this stay. The house is extremely well equipped. Basically everything you could possibly need is provided. The house is in great shape. It's obvious it is well taken care of. The rooms were clean and sizable. The kitchen is roomy providing plenty of space for food prep and cleanup. The upstairs bedrooms are very spacious and airy. The bed's are very comfortable which is of great importance to me. Also, the house is in a great location for whatever you want to do. There are kayaks and a canoe provided which we used a bit but we took our boat with us and the house is conveniently located to the public launch (just a couple of hundred yards away) and provides a great deep water slip. We fished, tubed and took wonderful boat rides. We also explored the land area as the "cottage" is located near Watertown, historic Dexter, the quaint and beautiful village of Sacket's Harbor (made famous by several battles during the War of 1812), Alexandria Bay, Clayton and we toured Hart Island and the beautifully restored Boldt Castle. If you are simply into relaxing, this spot is fantastic. Located right on the shores of Chaumont Bay/River, there is a comfy hammock and outdoor chairs as well as outdoor accessories to make you drift off into la-la-land to the sound of the water lapping at the shore. Obviously, we fell in love with this place. And last but not least, if needed, Amanda is just minutes away to answer any questions or provide any help that might be needed. Probably won't need any, but she's friendly, helpful and nearby. Larry Thank you so much! We are so happy to hear that you loved our little slice of heaven as much as we do! I love hear of people making memories at our lake house and we hope you come back again some time! Thank you again! We had a thoroughly pleasant stay; the owners were very helpful and welcoming, and the area and house are beautiful. The rental house was well prepared for your arrival. Out of around 100 house/cabin rentals over the years, this place was the most accommodating we've stayed in. The location for an ice fishing rental is almost as good as it gets. Close By is Awesome and unique fun shopping at the Lake Ontario Gift Shop, White Caps winery, a new local winery plus 3 great restaurants in town! The Blue Heron, Wise Guys and The Crescent! Chaumont Barrons Nature Preserve, Great area for biking around the lake, 15 minutes to Historic Clayton and Sackets Harbor and more!